At McDonald & Wetle Inc safety isn’t just a word we say. It’s our way of life. From the top down we are committed to creating a safe environment, and great working culture. We recognize that the industry we work in is a dangerous one, yet we make sure to eliminate as many of the hazards as we can and put our people first. We are very proud of our people and the safety culture we have created. 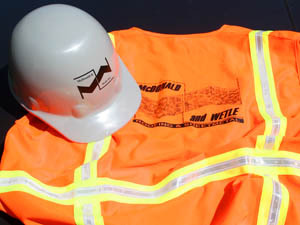 McDonald & Wetle Inc employs a full-time Corporate Safety Director who has implemented many programs aimed at providing safe working conditions, through continuous training and education. 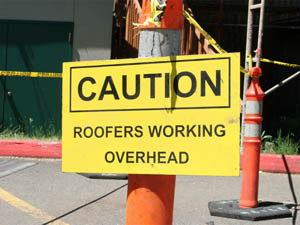 This has created a safe work environment, helping to reduce job site incidents and eliminate injuries. We are extremely proud of our progress over the last five years. As an indicator of our progress, we have reduced our mod rate (EMR) to a nationally recognized low of .57. 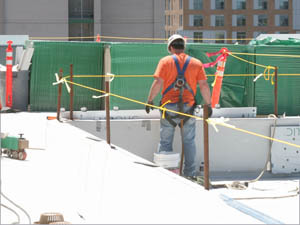 Job site visits regularly and safety audits performed. Safety orientation for all new employees. Yearly safety refresher course required by all employees. Daily pre-task plans signed off by all employees. Site-specific safety plans and JHA’s. 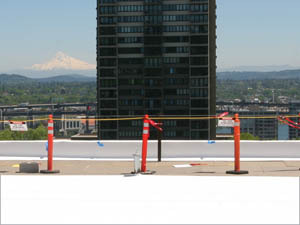 An emphasis program on fall-protection. At McDonald & Wetle Inc, safety is our number one priority. “No task, job or contract is more important than human life”.